RETURN ... Sunderland midfielder David Vaughan. DAVID Vaughan is likely to start this weekend’s clash with Fulham on the bench as Steve Bruce adopts a cautious approach with the midfielder. Vaughan missed Sunderland’s last game at Manchester United, before the international break, after failing to recover from a groin strain. The 28-year-old was subsequently ruled out of Wales’s friendly with Norway last weekend and only returned to training at the Academy of Light this morning. If fully fit, Vaughan would have been in contention to return to the starting XI after impressing in his six top-flight appearances for the Black Cats. But boss Bruce is wary of throwing the former Blackpool man straight into the fray for a crucial game against fellow strugglers Fulham after just two days’ training. And with Lee Cattermole and Jack Colback working effectively together in central midfield at Old Trafford, there is no urgent need for Bruce to recall Vaughan. Bruce said: “Vaughany might be all right and we’ll look at his fitness today and tomorrow. “But when players have been out for a while and haven’t trained much, I usually think twice about starting them. “He’s been out for two-and-a-half weeks and it’s a tough ask to start with him after just training on Thursday and Friday. The more pressing conundrum for Bruce is who occupies the wide midfield slots, with the suspended Seb Larsson and injured Connor Wickham both ruled out against the Cottagers. Ahmed Elmohamady is likely to provide a like-for-like replacement for Larsson on the right-hand side of midfield. Likewise, Ji Dong-won would be the obvious stand-in for Wickham, but Bruce is wary of of handing the 20-year-old his first Premier League start after his international exertions. Ji, criticised for his fitness and form by South Korean coach Cho Kwang-rae, played the first half for his country in last Friday’s World Cup qualifying win over the UAE and was then left out of the side which embarrassingly lost in Lebanon on Tuesday. 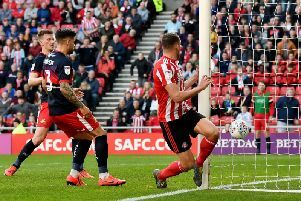 While Bruce is not particularly concerned by Kwang-rae’s attack, the Sunderland boss believes flying halfway around the world takes its toll on any player. That could prompt Bruce to use Stephane Sessegnon in attack alongside Nicklas Bendtner, with John O’Shea returning at full-back and Kieran Richardson pushing into midfield.